Oh yes. 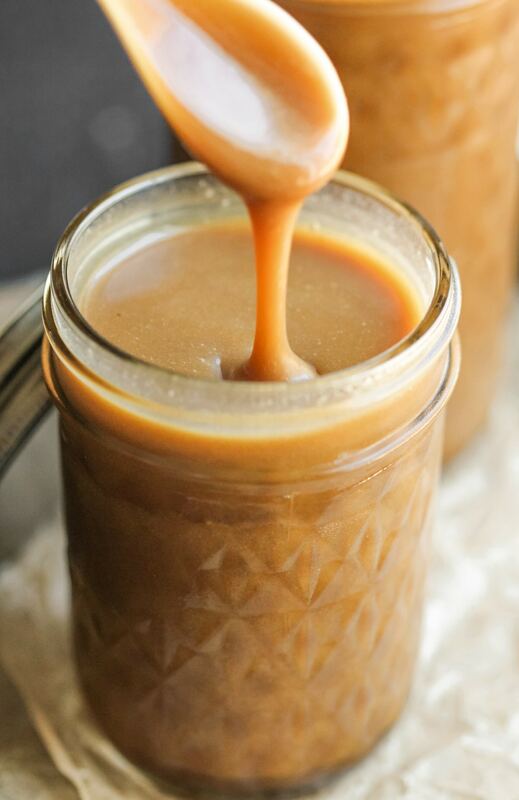 Not just homemade caramel sauce… HEALTHY HOMEMADE CARAMEL SAUCE!! It all started with those Millionaire Shortbread Bars. I was shocked at how the caramel layer turned out perfectly. As I stirred the cooking caramel on the stove I craned my neck over the pot to smell that smooth, creamy and enticing scent. It was so similar to real caramel I couldn’t believe it. I mean, sweet and velvety caramel sauce without the heavy cream, white sugar and butter? 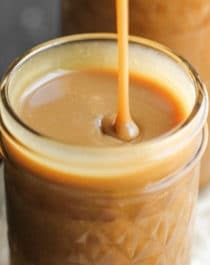 I have wanted to make a Healthy Homemade Caramel Sauce for so long now. The process seemed intimidating, but I love love love the taste of caramel. I could never find a healthy option at the store, so I overcame my fear and finally made a batch. And dang, I am SO glad I did. Watching this liquid gold pour into the mason jars was a heavenly sight. This Healthy Homemade Caramel Sauce goes well over everything… Individual Apple Pies, Vanilla Ice Cream, Pancakes, Waffles, etc. You can stir it into your coffee or add it to smoothies and milkshakes. You can pour it into your mouth, bathe in it, marry it… or is that a little too much? Eh, no such thing. Ever wondered how to make caramel sauce? Wonder no more! 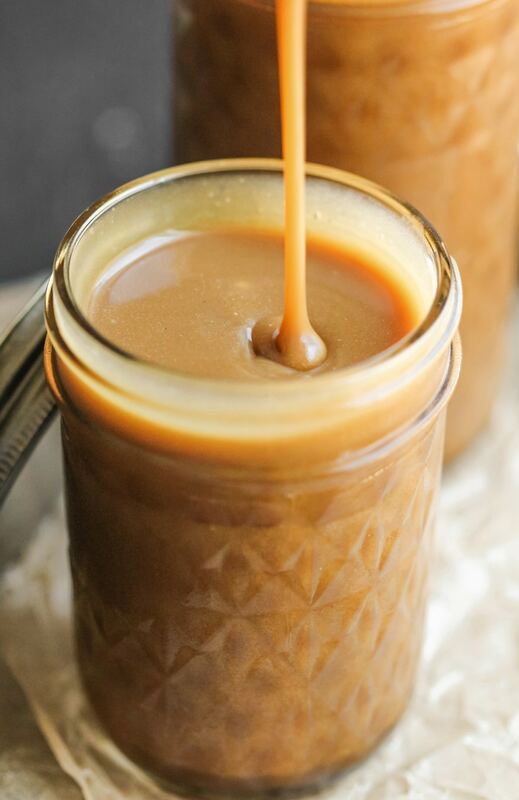 This Healthy Homemade Caramel Sauce is so good it's hard to believe it's refined sugar free, gluten free, dairy free, and vegan! In a small bowl, whisk together the coconut milk, coconut oil, and salt. In a small saucepan (I used a 2-quart saucepan), add the maple syrup, water, sucanat, and erythritol. Add a candy thermometer to the pot and place over medium-high heat. Do not stir, let it come to a boil. At 250 degrees Fahrenheit, remove the pot from the heat and whisk in the coconut milk/oil mixture. Stop whisking once it's all added. Return to medium-high heat. At 220 degrees Fahrenheit, reduce the heat to medium-low and cook for 5 minutes. It should look like a dark caramel syrup. Whisk in the vanilla. Pour the mixture into a heat-proof container (I used a 4-cup measuring glass) and let it come to room temperature. Cover and refrigerate overnight. Keeps for ~2 weeks. Whisk before serving. If you want a thicker caramel sauce, simply reduce the amount of coconut milk by ¼ cup. PS: Looking for a SOLID caramel recipe? Check out my Chewy Caramels or Cashew Caramels! This sounds AMAZING. Caramel is one of those things that you just NEED for some desserts, but it’s so HEAVY. 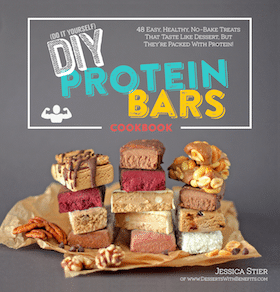 Will absolutely be trying this for a whole bunch of recipes. Why do you not own the condiment and dessert industry? The earth would teem with well-nutritioned superhumans. You can buy nonhydrogenated shortening online. You can try using coconut oil. Coconut oil may smell like coconut out of the jar but I don’t think it will provide a strong flavor in the caramel since there is only 1/4 cup of it. If you want that classic butter taste like in REAL caramel, you can add ¼ tsp butter extract at the end along with the vanilla extract. has anyone tried brown rice syrup in place of the agave? is there anyway i can make this without using the thermometer ? Thermometers are cheap and easy to find. I bought mine at Bed Bath & Beyond! I know, this is really old question, but I have the solution! I made this without thermometer, actually I have never use one when making candy sauce. I use the cold water test. You know your sauce is ready when you drop a hint of sauce in to cold water and it keeps its shape. If you keep sauce on the heat after that it will be too thick..
Hi, will these make caramel apples? Hmmm, I’m not really sure I haven’t tried that yet. I think you can give it a try, just dunk the apples in and quickly put them in the fridge to firm up. At room temperature this caramel sauce is probably too much of a “sauce” to stay on the apples, this is more for drizzling into coffee and over desserts. If you don’t want to risk the caramel running off the apples then I would recommend my healthy soft caramels recipe. Just skip steps 7-11 and coat the apples in the caramel “fudge” after step 6. I hope this works out for you, I didn’t even think about making caramel apples until I read your comment. GENIUS!! PS: Also, I’m sorry, I didn’t measure how much the caramel sauce makes but I believe it is around 1+1/3 cups. ..and oh also how much does this yield? It filled one 500ml mason jar perfectly. Thank you for this great recipe!! Xylitol is different than erythritol, but they have many similar properties and basically taste the same. Thanks for providing the final yield amount, I forgot to measure the caramel out because I used some in my coffee right after making it. Oops! You can probably use any other nondairy milk out there, such as soy milk, more almond milk, other nut milks, etc. Hopefully this works just as well as coconut milk. I hope you like the recipe! oh oh…want this! do you think it could be made with coconut sugar instead of succanot? How long will this stay good for? What is the best way to store it? I stored my caramel sauce at room tempe because refrigeration will cause the sauce to harden. Hope you like the recipe! Can I use a regular thermometer ?? I have the same question as Crystal, any idea how long it would stay good for? Does it need to be refrigerated? Thanks! Thanks for commenting, for some reason I didn’t get a notification of Crystal’s comment! Is it 1 cup + 2 tbs light coconut milk, canned or carton? I made these today and it turned into thick caramel. I followed the instructions exactly, what could have possibly gone wrong and is there any way to make it saucey? I’m not sure what went wrong if you followed the ingredient list and instructions… did you caramel sauce just turn very thick, did it set into “sliceable” caramels or did it harden into a toffee-like brittle? These are signs that the caramel may have been overcooked (only a few degrees can change the final product). As for making your caramel more liquidy, try heating it up again on the stove and adding more coconut milk. Whisk in one tablespoon at a time until you like the consistency. Thank you for your help Jessica! That could have been the problem! I stepped away for only a few seconds and the temperature reached a little over 250 degrees Fahrenheit before I added the vanilla extract. The caramel thicken, yet soft enough to slice. What is the difference between using coconut milk and almond milk and canned milk versus carton milk? Do you know if the caramel will spoil since there is milk in it? Here’s an update, I incorporated the caramel last night to make Samoa Cookies, and sadly the caramel was so hard, but not as has as brittle. I melted it and added more coconut and almond milk. That caramel sauce looks yummy. Besides replacing agave with maple syrup can the succanate & erythritol be replaced with coconut Sugar? What is inside of the apples on those pictures? Just trying to come up with some dessert ideas. Hey Jess, I love that you actually respond on here and have always answered my questions. I was wondering why shortening vs butter? and by butter I mean the real stuff not margarine. I could probably good the differences and figure something out but I was just curious about your personal logic between the 2. I was hoping to use this in a Salted Caramel Gelato recipe. If it works out I’ll send you the recipe! 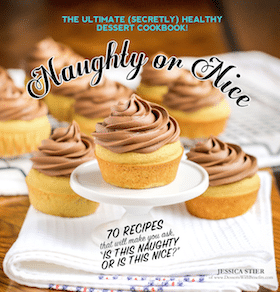 I made a full sugar full dairy version to make sure it turned out ok before I start replacing things with almondmilk and erythritol 🙂 Thanks for helping us indulge our fantasies of enjoying treats without having to run 10 miles afterward! I used the non-hydrogenated vegetable shortening because it’s what I had on hand, and coconut oil didn’t seem like it would work as well. I’m sure butter could work just fine in place of the shortening! I always recommend organic grass-fed butter (for the omega 3’s and a better ratio of 3’s:6’s). 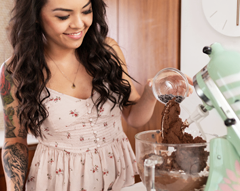 What could I use in place of Erythritol? Would need to be gluten free dairy free soy free…? Hello Jessica, Quick question – What is the nutritional information for this sauce? Also, do you have any recommendations to reduce the sugar further by replacing the Agave Nectar with an alternative, as well as the Sucanat with perhaps additional Erythritol? Any advice on these questions and the nutritional breakdown with these changes, as well as in the original format would be appreciated. Thank you. I didn’t calculate the nutrition facts for this recipe, so I’m not sure. I’m considering revamping the recipe though, and if I do, I’ll add the nutrition label then. I wouldn’t recommend omitting the agave (you can try replacing it with maple syrup if you don’t like agave), however, you can try reducing the sucanat to 3/4 cup and increasing the erythritol to 3/4 cup. Just know that too much erythritol can cause the sauce to crystallize. I made this today. I use a mix of coconut palm shortening and ghee for the shortening. Also use a mix of maple syrup and coconut syrup. Use xylitol and stevia as the sugars. Also used some homemade coconut milk. Seems to taste pretty good. Just waiting the hour before storing to use tomorrow. Wow it looks so silky and smooth ! Caramel on everything, please! Also, I love the gif! This literally looks JUST LIKE unhealthy caramel sauce! That’s CRAZY! I would probably finish a whole jar within a week! We usually use a traditional caramel made from scratch but, will give this a try at home! Do you think this could be used to make caramel corn? Pingback: Healthy Apple Pie IN AN APPLE! You'll wow EVERYONE with this recipe! How can this be healthy when it’s maple syrup in it? ?